Thanks for stopping by the Seth Wadley Ford Of Perry service site; your one-stop spot for the top Ford service and assistance in Perry. 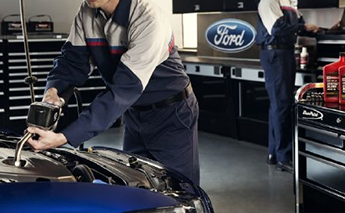 Whether you are tackling a substantial repair or just a regular tune-up, there is no doubting that our lineup of professional Ford authorized technicians are here to steer you through each portion of this process. For those men and women out there who have a vehicle not of the Ford model family, the Seth Wadley Ford Of Perry team would be more than delighted to help you during this important process. The people who proudly serve on Seth Wadley Ford Of Perry's expert group of service and repair specialists are well-versed on a hefty amount of makes and models not from Ford, so you can always feel comfortable knowing that your non-Ford automobile is in good hands once you roll onto the Seth Wadley Ford Of Perry lot. Before you make your final decision regarding your repair concerns, please join us and get to know why so many of our friends in Perry will not take their cars in for service and restorations anywhere else. After doing this, chances are that you will be ready to get the ball rolling on your service needs and plan out an outing to Seth Wadley Ford Of Perry in the near future. Why Should I Book My Car Service at Seth Wadley Ford Of Perry? A Commitment to Quality and Safety – Your safety is our main goal, so you can hit the streets of Perry with confidence knowing that we will do whatever it takes to get your vehicle back in action in as expedient a manner as possible. Keeping a Close Eye out for Your Financial Concerns – Looking for the top car service in Perry, all at a reasonable and budget-friendly price? Then make a trip to Seth Wadley Ford Of Perry and it will not take you long to see just how important it is to us to keep you on budget. Access to the Finest Replacement Parts – Need to bring your Ford car to the Seth Wadley Ford Of Perry service department? Then you will be happy to know that Seth Wadley Ford Of Perry has access to any official original equipment manufacturer (OEM) part required to change out the damaged or faulty piece in question. The moral of the story here? Seth Wadley Ford Of Perry is more than able to set the gold standard for car repairs and service in Perry OK for people who want to get their cars back on the road in a quick and affordable manner. Taking a deeper look, Seth Wadley Ford Of Perry is not just the dealership that provides the greatest combination of dependability and value, but also home to the most skilled collection of Ford licensed mechanics. While having access to these certified experts might not seem all that remarkable on the surface, the reality of the matter is that the years of hard work and instruction undertaken by these individuals effortlessly supersedes what you will come across at any of our local competitors. Naturally, these shade-tree organizations may speak a big game or leverage cunning sales strategies at times. Even so, it is still vital to understand that only licensed Ford professionals have spent the countless hours necessary to receive this esteemed appointment from Ford. Furthermore, acquiring this status also affords our technicians with the ability to reach out to Ford and stay abreast with all of the latest news and insight into Ford cars and proper service and maintenance procedures. When it comes to making sure your automobile is able to take the road without risk and in a reliable fashion, are you honestly ready to accept anything less than the quality service and heightened expectations that come with hard work performed by an accredited Ford mechanic? Oil Changes – Neglecting to regularly change your oil is a fast way to wear away the integral parts of your engine via a shortage of lubrication. Tire Rotations – Wearing, splitting, and bald spots, as well as a greater risk of auto accidents, are all warning signs of tires that are not rotated on a consistent basis. Timing Belt Changes – An unattended timing belt is akin to an impending disaster in that it can cause severe damage to a car's motor if it reaches the stage of acute degradation and breaks down during your daily routine. Brake Inspections – Even though most things related to your brakes might feel boring or mundane, setting aside a few moments to check these important components on a consistent basis ensures that they are ready to perform properly when you need them most. The point here? Bypassing the regular upkeep your automobile desperately requires to stay in top condition is never a strong choice. The health of your car is at stake, so go ahead and reach out to Seth Wadley Ford Of Perry when you are ready to tackle these straightforward services. Now that you are up to speed with the need to come to a reliable service provider like Seth Wadley Ford Of Perry for your service and maintenance concerns, it is time to help you develop a suitable service timetable. To get off on the best foot with this undertaking, make it a point to give the Seth Wadley Ford Of Perry team of proficient auto technicians a call at (580) 307-3270 today. By deciding to manage your service needs with the assistance of the crew here at Seth Wadley Ford Of Perry, you will be taking a great step toward lengthening the useful life of this vital asset. Considering how significant keeping your vehicle in peak shape is to your everyday routine, and your time spent journeying outside of Perry, it makes a ton of sense to hook up with the Seth Wadley Ford Of Perry crew at once and get back in order with your routine service itinerary in the near future.